These look delicious – and so professional. I have seen so many macaroons in food blogs in recent months. It seems to be a current craze. I’d love to make some but am useless at piping. Thanks! They worked out well, but I have to confess that it did take a little practice for me to get macarons right. The first time, it was just one large (but tasty) mess. But do give them a try – you will get there in the end! I thought I spied a little raspberry in there, they look wonderful. 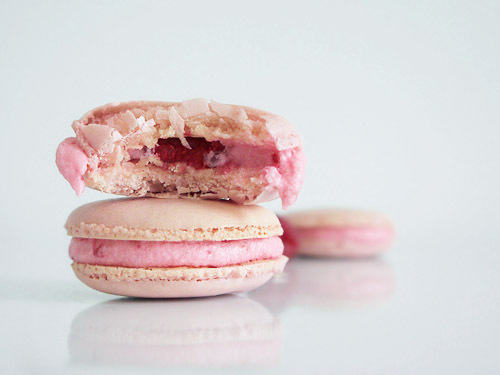 Macarons is something I have not attempted yet, but one of these days…. 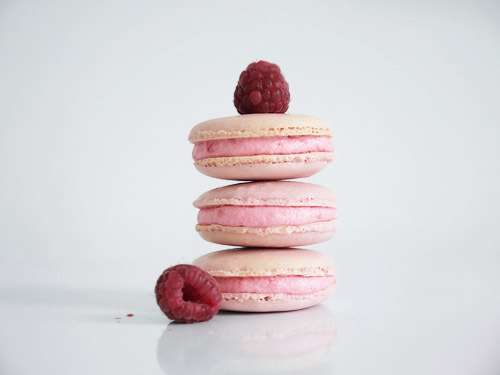 The raspberry was just a little idea to make sure that these macarons really did taste like fruit. V happy with how it worked. I know what you mean about them being a bit daunting – my first attempt was one giant, flat cookie. Second attempt were like chocolate rocks. Bit even the “failures” taste nice. Just set aside an afternoon and try a couple of times. Good luck with them! Any ideas yet for a Danish-inspired flavour? I just started browsing on your blog when I saw you on freshly pressed. Love the idea for macarons and totally agree with the faff around buttercream. I think my next attempt at macarons would definitely involve raspberries as well, but maybe paired with a simple white chocolate ganache – equally “low-faff” as your buttercream and I like the contrast of the almost cloyingly sweet white cocolate against the slight zing if fresh raspberries. I saw you linked to Mmmmh in Brussels – I spent 6 months working in Brussels a couple of years ago and this was my favourite shop of all. I would go in there at least once a week to admire the 10kg bags of Valrhona chocolate and the endless selection if silicon baking moulds. I bought many a birthday present for myself there and whenever I am in Brussels for work or to visit my sister who lives there I make sure to stop by.